Heather Ann Creations introduces a 2 door console cabinet with a Circles Glass insert finish. Designed with dimensions of 32" x 14" x 30" and a total weight of only 41 lbs., it is lightweight and easy to place in your home without taking up much space. 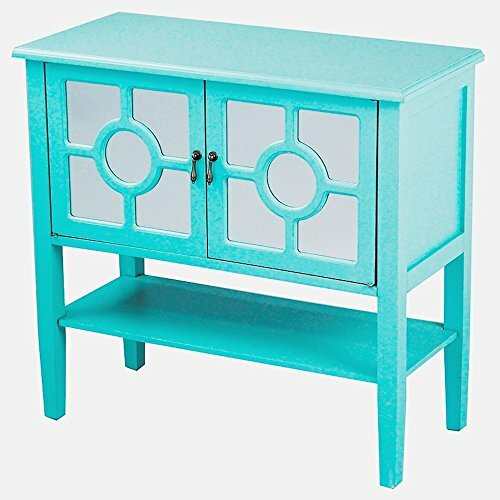 Crafted from a wooden frame, this console cabinet has a Circles Glass insert finish to provide you with a quality, stylish and durable storage solution to your home decor. With a modern finish, this console cabinet will accentuate your decor in a captivating way. Enjoy the elegance and simplicity found within this console table and provide your home with the final touch that you have been looking for. Heather Ann Creations has designed some of the finest, most distinctive photo frames, wall decor and tabletop accessories for over twenty years. Proudly embracing classic antique carvings of the 18th & 19th centuries, Heather Ann gracefully blends traditional and contemporary beauty. Fab Glass and Mirror 1/2" Thick Beveled Tempered Radius Corners Rectangle Glass Table Top, 30" X 48"
Elegant Lighting 3 Drawer 4 Door Cabinet in Silver Clear 60" x 14" x 36"